This month’s Employee Spotlight is shining on our newest forensic interviewer at Kids Talk, Ty Osborn! After joining the Kids Talk team in April, Ty quickly learned the ropes and became certified to conduct forensic interviews in July. To obtain her certification, Ty attended a week of “ChildFirst” training in Jackson, Mississippi, put on by the Gundersen National Child Protection Training Agency. During training, Ty practiced her interview skills and techniques with actors and took an extensive written test. Upon her return, Ty hit the ground running and started helping the team with its ever-increasing caseload of child abuse and neglect investigations in Madison County. Ty has also been working as a victim advocate for some of the children and youths that come into Kids Talk on a daily basis. Ty, thanks for your commitment and dedication to Aspire, Kids Talk, and all of the children that you stand up for and help! We have changed the way that calls are handled at Aspire’s new Engagement Center to enhance and improve the experience for those we serve. We have increased the number of Access Engagement Specialists to six and have implemented a centralized scheduling system to better manage the time that it takes our providers and support associates to schedule and serve our clients. Callers into Aspire are now given options to wait in a queue for the next available specialist, leave a voicemail, or dial the extension of the person that they are trying to reach. Our enlarged team of Access Engagement Specialists work throughout the day to address messages left on voicemail. Under the old system, calls went directly to voicemail almost half of the time and calls were often transferred multiple times before reaching the appropriate Aspire staff member. We hope you find the new system easier and more convenient! 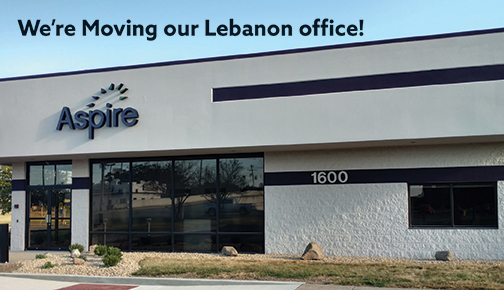 Beginning on September 25th, Aspire will be located at 1600 West Main Street in Lebanon. We recently dedicated our office building at 2020 Brown Street in Anderson to Aspire President Emeritus Rich Dehaven. Here's Rich (left) with Aspire Board Chair John Demaree (middle) and Aspire Indiana Health Board Chair Duane Hoak (right) at the dedication ceremony on September 27, 2017. The Dedication Ceremony took place during Aspire's Consumer Art Show. Consumer Advisory Board Chair Amy Graham encouraged guests to take time to look at the art and talk to the artists who created the pieces on the walls of the DeHaven Building.